Asako went in search of nettles this past week on the 21Acres Farm. Enjoy her advice AND a recipe! Seeing nettles on the farm is one of the first signs of spring. In America it is common to eat them as soup, risotto and such. Being Japanese, I like them simple as a blanched salad (Ohitashi) and eat it with bonito flakes and soy sauce. 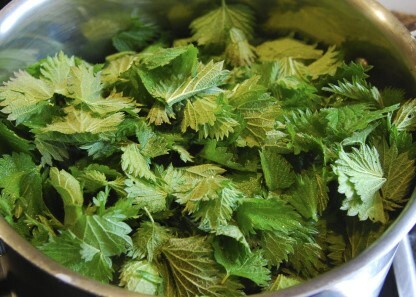 I also like tossing the blanched (and cut to bite size) nettles with a sauce made with nuts or seeds. Don’t forget to squeeze out the water very well after blanching otherwise your sauce will be watery. Oh, and nettles have thorns, I mean really, really painful ones. They have histamines and it burns for days. 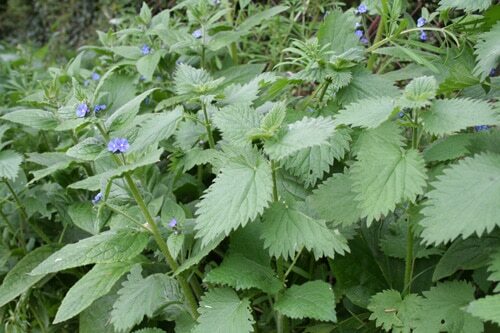 Nettles are extremely nutritious, and are said to be effective for seasonal allergies. Chinese medicines include them as an ingredient, and Native Americans used them too. Just be careful when handling them raw; wear heavy gloves when harvesting, and until you’re done blanching. 1. Blanch nettles (I normally blanch twice; 30 sec. to 1 min each time). Squeeze water out well. Finished amount is about 1 cup (if start with approx. 3-4 cups of fresh nettles.) Cut into bite sizes. 2. Mix the following ingredients in a small blender to make dressing. Pulse them together to mix and become saucy.